i search all fg sites they seem to not have any in stock..im looking for the carsons wheels. also i search for pictures thur online looking for proline wheels. and found molezer mowery Fg buggy with some proline alloy..now thats, what im looking for too..any one can give me some info on proline alloys and tires and adapter to fit the Fg ..im very interest in it. or places that have smartech wheels. i sold off my Fg bigfoots dirt cheap..
RE: where are the smartech wheels? Hi have you found wheels? which ones you wanting? Smartech MT wheels or buggy wheels? Tower would have both because the Smartech, and Duratrax MT, and buggy are the same. Just get the new type Smartech MT Wheels, the ones from their 4WD or Carson Gas Devil. the USA importer for Smartech is jhc-888.com they are also the parts service center ask for James Hann. Skinny (XtremeRC) fame may be joining them as product support. 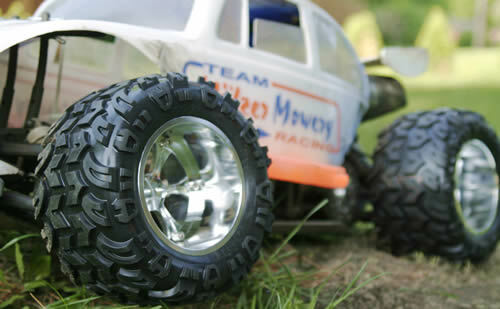 yup those are the ones im looking for, the smartech mt 4wd wheels.. cant seem to find it. so where are they? and thanxs for replying! I got mine from Germany, where they are named Carson Comanche wheels.